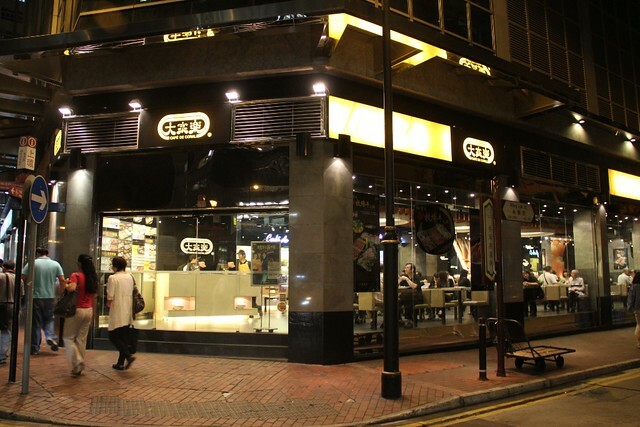 Cafe de Coral is practically a verified fast food institution in Hong Kong. 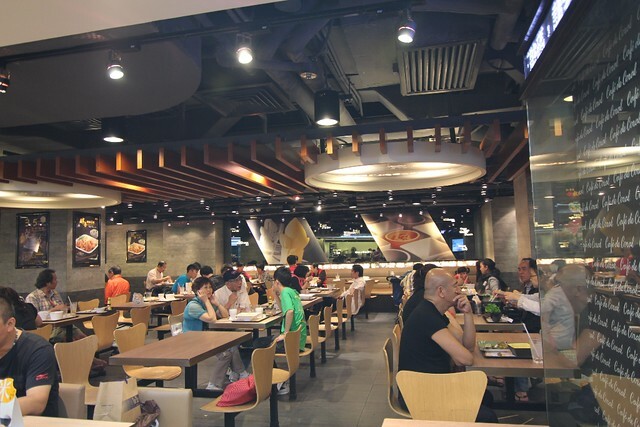 The food is cheap, there are a lot of choices on the menu, and it has branches that can be found in nearly all major shopping malls and neighborhoods. 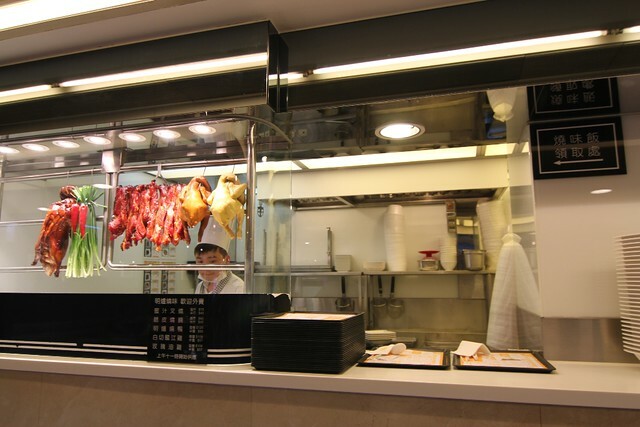 We chose the branch in Starhouse Plaza along Salisbury Road, since we were already there to see the sights in the Tsim Sha Tsui area. We were still full from all the sandwiches and pastries from our late afternoon tea in The Peninsula Hong Kong so by the time we were hungry and had dinner in Cafe de Coral, it was already past 9 pm. Surprisingly, there were still a lot of diners at that time. 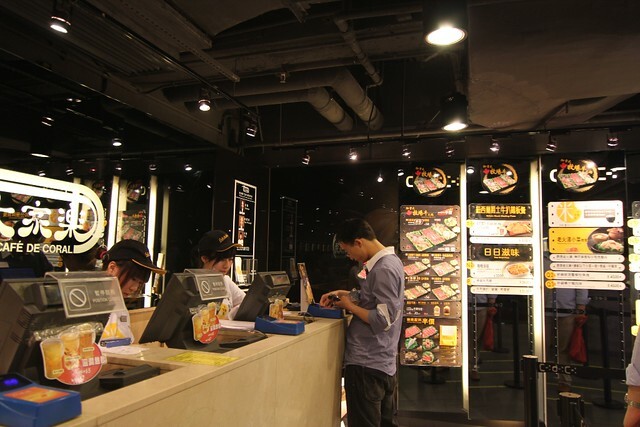 We ordered and paid by the counter, choosing our food from several menu items. 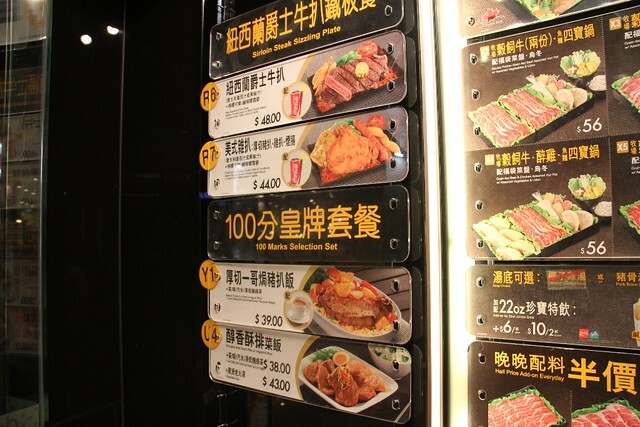 The prices of their food range from HK$30 to HK $50, some of which are set meals and already include drinks. There’s a lot of variety in Cafe de Coral’s offerings, and supposedly the menu changes from time to time to include new specials. After paying, we had to give our number to the staff at another counter for them to prepare our orders (which was easy and fast enough since we ordered roasted food). 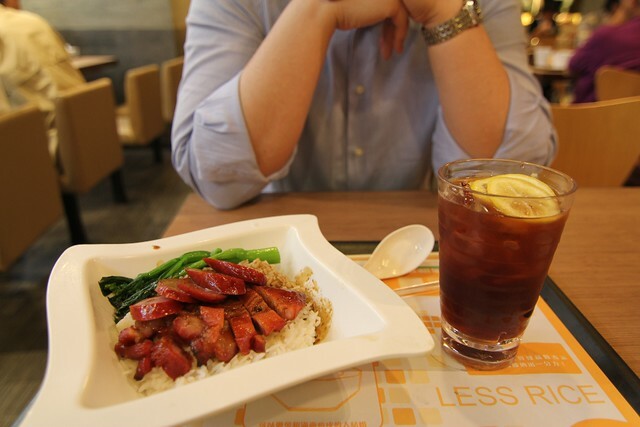 We had barbecued pork and roasted duck, complete with iced tea and cold milk tea. 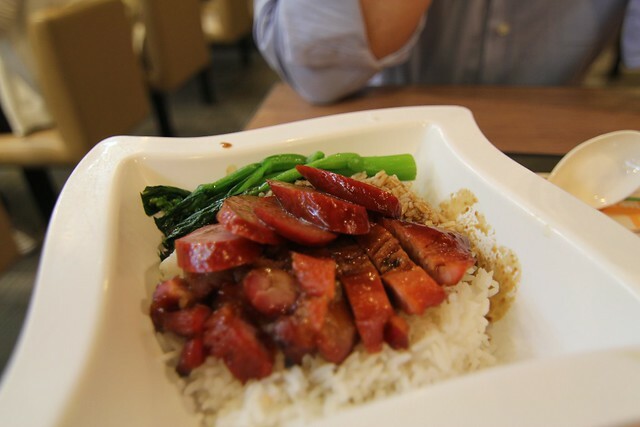 We also had the chance to try out Cafe de Coral again on our fifth day in Hong Kong. We were so tired from all the walking we did that day and as soon as we reached our hotel in the Sheung Wan neigborhood, I ordered take out from the Cafe de Coral in a nearby street corner (at the corner of Wing Lok and Morrison Streets) and ate it at our hotel. 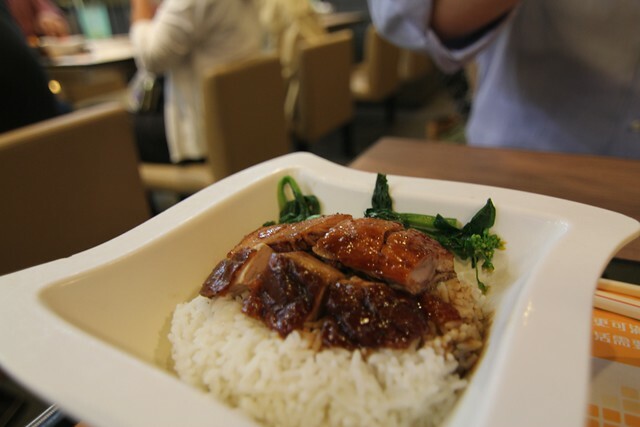 The baked thick cut pork chop with rice and green tea was HK$39. The food in Cafe de Coral is fast and fuss-free. 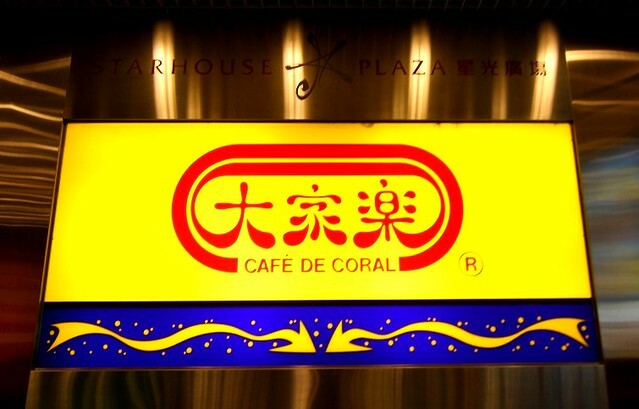 Cafe de Coral is the Chinese/ Cantonese equivalent of something like Jollibee here in the Philippines so you can’t really expect food with gourmet quality. 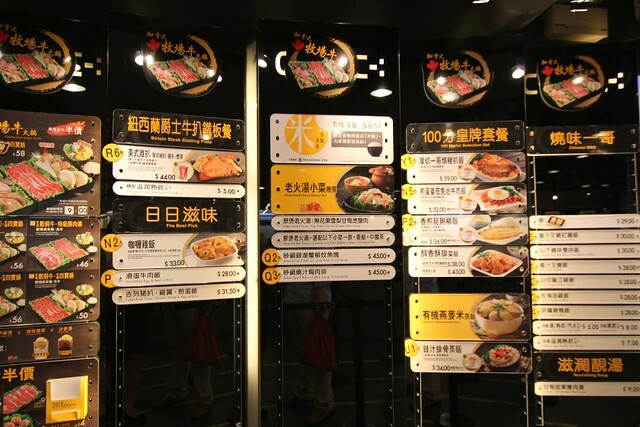 But that means the food is cheap and you get value for your Hong Kong dollars, especially if you’re craving for a rice dish but you’re not in the mood to brave a full-on hole-in-the-wall authentic Chinese restaurant. And just like our good old Jollibee, you can’t go wrong with your orders and what you’ll get is good old comfort food—in a clean, well-lighted place. Fast, cheap, and happily convenient. That’s Cafe de Coral for you. For Cafe de Coral branches, click here. Really sweet and awesome..sure to visit here.. Thanks B! That means the pictures worked 🙂 hehe.